By Anna Bolton - adewine@aimmediamidwest.com - Editor’s note: this is the third story of a series celebrating GCCC’s 50th anniversary. Submitted photo Auto tech students work on a car at Greene Joint Vocational School in the 1980s. XENIA — This week gave many alumni a good reason to reflect on their Greene County Career Center years, as they looked back and celebrated the school’s golden anniversary. The journey to the career center — or “Greene Joint Vocational School” — began the same for many students. “During my ninth grade year at Ferguson Junior High, My OWE teacher Gary Wise took my classmates and I to the Greene County Career Center for a tour and orientation. We got to see all of the different career courses that were available, and we took dexterity tests and answered written questions that helped to better match the career fields we would be most interested in,” Robert Jolly, Class of 1996, said. Jolly entered the career center his junior year and enrolled in electrical wiring. Other students like Jolly across the county realized they, too, needed more than what their home schools offered. Rider-Pritchard’s class initiated the first yearbook and the first set of GCCC green tassels for graduation. Aimee Brest Sparks, Class of 1994, had a similar experience a decade later. Sparks and Rider-Pritchard remembered their teachers, as well, who they said worked with them individually and pushed them toward success — whether that meant encouraging them to run for club president or bringing them study materials after gal bladder surgery. And for many other graduates, their vocational education stays with them every day in the workplace. Cecil Day, Class of 1983, still works in the electrical and controls field. So does Jolly. After graduation, Jolly received his electrical wiring certification. Now he has his own small electrical business, Roberts Electric. “It was the best decision I ever made,” he said. Another graduate, Brandy Shelton, Class of 2000, reiterated the same statement. She’s self-employed as a cosmetologist and she’s an educator for an international colorline. Matt Thomas, Class of 2001, too, transformed his education to a career path. After learning computer office technology from teacher Shirley Cottle, he entered the business office field. A Class of 1997 student, Joshua Long, enrolled in the industrial engineering technology program and never looked back. “As a teenager, the career center put ‘school’ in a whole new light for me. The program focus, staff, and hands-on education lit a spark in me for engineering,” he said. Long went on to college. Now he travels the country, consulting manufacturers on ways to stay competitive in the current global environment. He’s looking back now — along with thousands of other alumni — but just to remind himself where it all began. 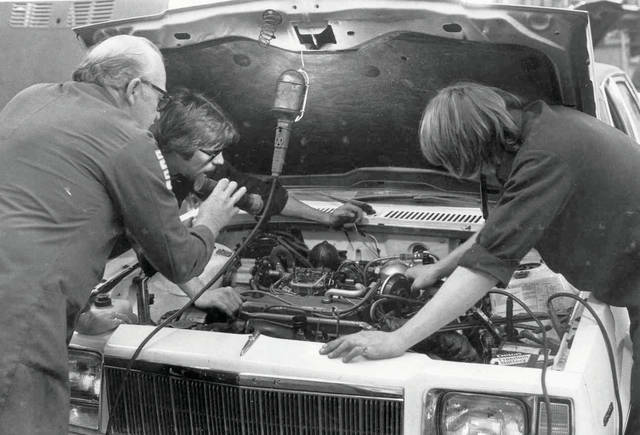 https://www.fairborndailyherald.com/wp-content/uploads/sites/50/2017/09/web1_Auto-Tech-80s.jpgSubmitted photo Auto tech students work on a car at Greene Joint Vocational School in the 1980s. Editor’s note: this is the third story of a series celebrating GCCC’s 50th anniversary.